These sentence structure prompts are on a fold out page (see example here) at the back of each student's journal. These posters are yet another reminder of the types of sentences students have learned. The photos are posted here in the progression that we follow and coincide with classroom topics of study. The bold lettered words in the sentence represent the sentence stem (the part students mimic), the outlined words are the words the student can provide. Our first K & Grade 1 sentences look like this. Students use words strips around the room and visual dictionaries. Always a hit in K and for some in grade 1; students write their name and who they like to play with. Following "Les jasettes" vocabulary games to become familiar with the language of clothing, students are able to add more description with "il porte" (he is wearing). During a shapes unit, students make shape collaged animals and then describe them. ie: "Voici un hibou. Il est bleu. Il y a neuf cercles." 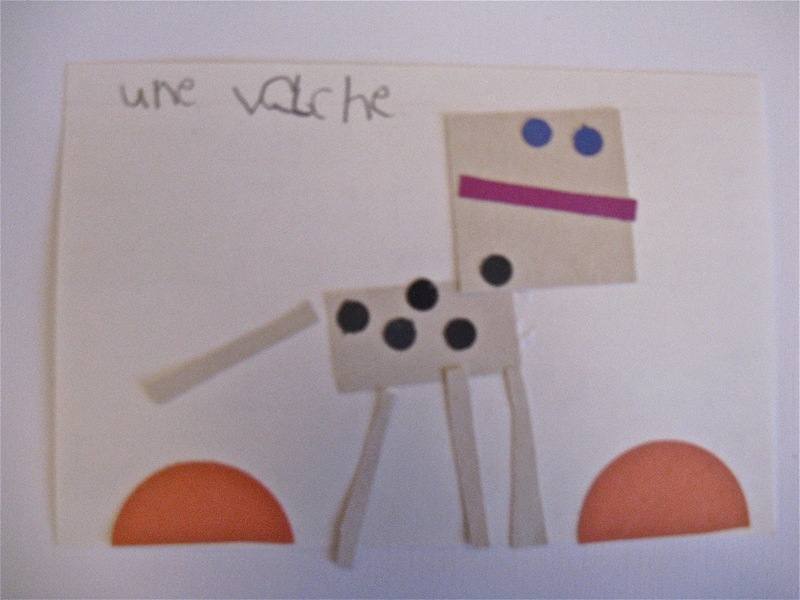 "Voici une vache. Elle est blanche et noire. Il y a un carré, six rectangles, sept cercles et deux demi-cercles." Students refer to these (yellow poster) as "Qui, quoi, où?" (who, what, where) sentences. Finally, during a unit of study about the needs of animals and their adaptations students write "Qui suis-je?" (who am I) sentences. They also photograph one another, write a "qui suis-je", and other students match the description with the photo.